Under the umbrella of Prime Minister Youth Program, the Government of Pakistan plans to enlarge the scope of the PM Youth Program by launching a scheme for distributing 500 Motorized or Electric Wheelchairs to empower special students (having disability) studying in HEC recognized Public Sector Higher Education Institutions in Pakistan and the State of Azad Jammu & Kashmir as well. The core objective of the scheme is to empower special students having disability and to enable them equally to contribute in economic development of the country besides institutionalizing inclusive development leaving no one behind. So that each one of us should participate in national development process equally with dignity and self-pride. It’s a wonderful electric wheelchair that would be helpful for special students. Disabled Male and female both can apply for getting wheelchair from government of Pakistan though HEC System.Prime Minister’s Youth Program is a Revolutionary programme for the socio-economic development of youth. It has broad vision of schemes aimed at enabling youth and poor segments of population to get good employment opportunities, secure economic empowerment, acquire skills needed for gainful employment, to enhance access to higher education and IT tools, avail on-the-job training or internship for young graduates. Higher Education Commission of Pakistan will be the executing agency of the scheme. During Phase-I, 500 Motorized/Electric Wheelchairs will be distributed to amongest special students enrolled in public sector Universities or Higher Education Institutions across the country and Azad Jammu & Kashmir on meritorious basis. Special Students of HEC recognized public sector universities and degree awarding institutions of Pakistan and AJ&K requiring ambulatory assisance. Students enrolled in Undergraduate, Postgraduate, MS/MPhil and PhD Programs. Valid Certificate of Special ambulatory need from relevant government institution duly verified by head of respective institution. From All over the Pakistan. 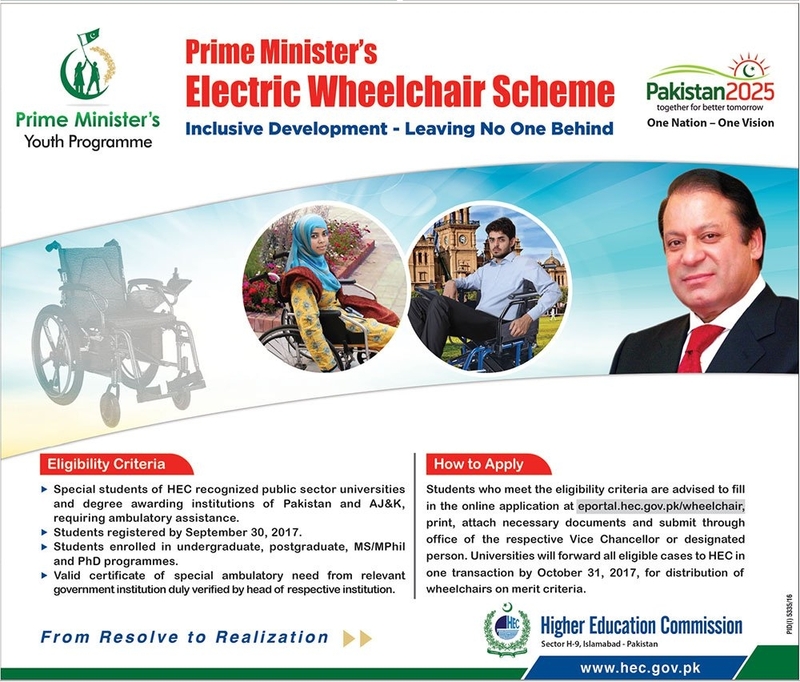 Procedure for Prime Minister Electric Wheelchair Scheme 2018 is concerned as Students meeting the eligibility criteria are advised to fill in the online application at eportal.hec.gov.pk/wheelchair, print attach necessary documents and submit through office of the respective Vice Chancellor or designated person. Universities will forward all eligible cases to HEC in One transaction by October 31, 2018, for distribution of Wheelchairs on merit basis. Eligible Students must get registration before the last date as 30th September,2018. Under Prime Minister Electric Wheelchair Scheme . To get more information please keep in touch with us. Where is the form for electric wheel chair?